We at IzelTech hold project quality as an all – important deliverable. This can be seen from the allocation of Test Engineers to the various projects – 25% of our engineers are exclusive test engineers. At IzelTech we have projects following both methodologies – The Waterfall model (see diagram below) as well as the Agile model (see the Software Development page). We must try to operate and test the performance of the product under normal operational use, by trying all possible user scenarios. We should give the customer not only what he says he wants, is required BUT what will be really useful to him in the long run going beyond the Statement of Work (SOW). For very complex modules, dev and QA together develop special Testing APIs which are used by QA to test that particular module thoroughly (using scripting/tools developed internally). 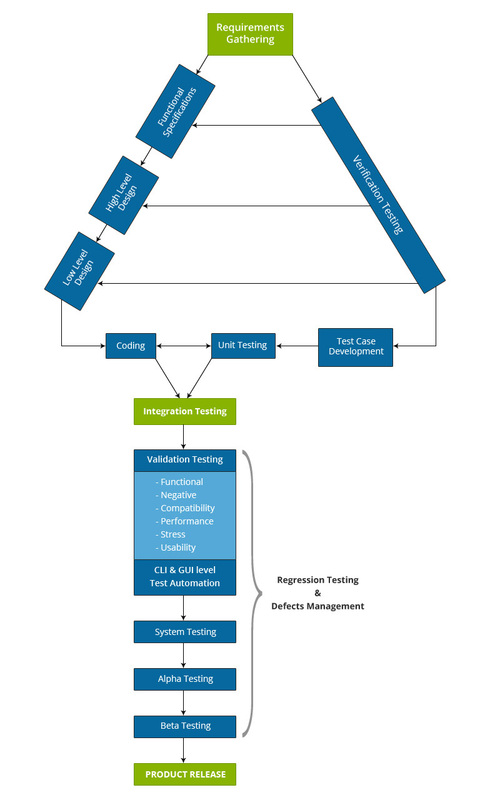 APIs are not needed for normal operation till the formal test execution cycle commences. Focuses on internal quality as against external quality. Code reviewed by QA, if required, by the client, to check that coding standards are followed; coding algorithms and code complexity are simplified and enhanced by adequate comments, so that later maintenance and updates are made easy. Every dev team comes up with the FIRST set of single-line test cases – usually the complex ones as design and coding is underway, and hands it over to the QA team for processing and further expansion. QA uses this set only as an indication and a foundation for future testing. Introduction of concept of QA team-member rotation (amongst product features) while testing within one team — to reduce boredom and fault-crop-up (due to running of same test cases manually, build after build). This increased QA team enthusiasm tremendously, as they became Jack-of-all- but Master-of-few-features. Automated new build reception on local QA server in off-time hours. Similarly, automated new bug delivery by e-mail to development team.